An online portfolio of tools designed to enable you to manage your own health and safety requirements. Click on the image to the right for a demonstration. From logging incidents or carrying out risk assessments to outlining policies and procedures, this package gives you control whilst benefiting from technical support covering a range of industries. The system also creates and stores a history of documents for your business’ auditing purposes. Risk assessment module – search from hundreds of pre-loaded risk assessments covering hundreds of activities and amend to suit your needs or generate your own from scratch, the module is clever enough to allow you to change the scoring system/methodology. You can then either print or email the risk assessment directly to site. 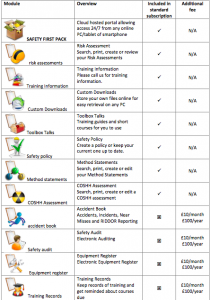 COSHH Assessment – either select from over 600 preloaded COSHH assessments, create a new assessment or use an existing one as a template. Toolbox talks Module – select from over 50 pre-developed toolbox talks – link direct to the HSE site for further specific topic guidance or upload your own toolbox talks. Accident reporting module – use this page to search for an existing incident report or to create a new one. Links directly to the HSE RIDDOR site for online submission. Search functionality to allow detailed statistical analysis type of incident name and/or of employee most common time of day etc.